Roses are an ancient plant. Fossil records show that roses grew wild 35 million years ago. Those ancient roses bore very little resemblance to the plants that gardeners grow for beauty and perfume in gardens today. There are around 150 species of rose that grow through the northern hemisphere that can be divided into climbing plants, trailing plants and shrubs. With so many rose species in existence, identifying roses can take some detective work. Observe the rose plant from a distance to determine its overall shape. The shape of a rose helps to determine its classification. Climbing roses have long canes that must be tied to a support. Shrubs have a low-growing habit. Hybrid tea roses have an upright growth and bear a single flower per stem. Grandifloras resemble hybrids in that they have an upright stem. But grandifloras produce clusters of flowers. Polyanthas are large shrubs that spread several feet high and wide and bear tiny, compact flowers. Floribundas are compact shrubs that bear lots of tiny flowers all season long in clusters along the tips of the shrubs. 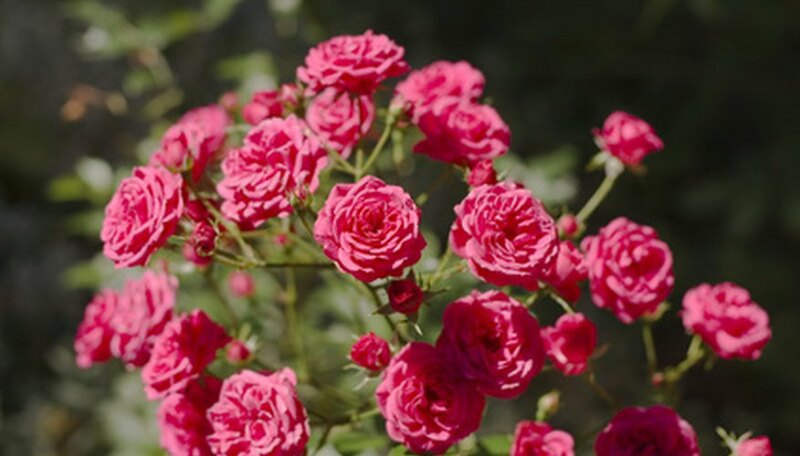 Miniature roses are produced on shrubs that never grow larger than 36 inches in height. The flowers are proportionally small as well. Watch a rose throughout the season to determine if it blooms in one single flush, or if it continues to bear blossoms all season long. Also take note of the age that the rose canes are when they bear blooms. Some rose plants will only bear roses on two year old canes. Chinese roses and many hybrid roses developed from Chinese varieties are roses that bloom repeatedly. Run your finger along the rose cane carefully to determine the size and shape of the thorns. Roses such as damask bear large, abundant thorns while others only have small prickles. Pick a rose blossom from the plant and examine the rose’s shape. The structure of a rose’s blossom is a strong indicator of the subgroup of rose. Some examples of rose structures include European varieties with single blooms that have only five petals. Centifolias, a cross between damask and Albia roses that are sometimes called cabbage roses are an example of flowers with many petals. Note the color of the rose blossom. Many rose variations are named due to their colors. Albia is an old rose with a name that literally means white. Inhale the fragrance of both the flower and the rose stem. The fragrance emitted by roses is another indicator of the rose’s identity. Moss roses are notable for their balsam scent. Chinese roses have a weaker scent than European roses. Tea roses are called such because their scent is reminiscent of black tea. Consult a master gardener program, county extension agent, field guide to roses, rose society or nursery to help confirm your classification of roses. Use a rose cutting or photo of a blossom with you for comparison against the photos in a book or to show to an expert. Because roses can hybridize with one another easily and produce new species, some rose varieties are difficult to classify, even by experts.